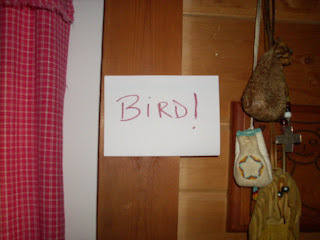 i learned how to cut and paste links in my blog posts, so i can harvest comments from various places and put them here. "hey, katie, i've been no-pooing....here is my "feedback" i've been mixing in one of those bottles that hair salons use for coloring (mine was new) and i use six ounces of water to wet my hair with the bs in the bottle, then about that much water to rinse it out...then another 6 oz. for acv...then another 6 oz. to rinse. i am using conditioner on my ends and leaving it in. my hair is past my shoulder blades and is medium in thickness :-) so far i love "no poo". " "so i did the soda thing for the first time today. it is a touch less clean than i am used to on wash day...but usually if i go without conditioner, my head goes all kinds of frizzy--and it did not do that today. so i am expecting good things. also...i'm going to experiment with frequency, this may mean i need to wash more often, or i may be able to stay on my five day schedule...we'll see. on this skin thing...i recalled this recently--i used to brew basil tea as an astringent, and i think i am going to do so again. it can be harsh, but for my semi-oily skin, it's really pretty mild. also plan to experiment with raw aloe as a moisturizer....."
"i've been experimenting with just cutting out a lot of the products that we've been trained to buy. i haven't used shampoo or conditioner for 8 months or so. i don't use anything else either. the first couple of months was pretty rough as my scalp re-acclimated and learned that it didn't need to over-produce natural oils. but these days a quick rinse in plain warm water every couple days works just great. really. my hair doesn't look greasy or dirty. i work a job with the mainstream public, and i still "pass" just fine. i'm off soap and deodorant for about 2 months now. again, just a good water rinse seems to work just fine. i do sometimes notice that i do smell a little strong for "mainstream" (never bad, just strong), but i figure my body hasn't had a chance to acclimate yet. i'm pondering my relationship with toothpaste. i'm not ready to try it yet, but i'm wondering if brushing with water would work just as well, once your body adjusted to it. laundry detergent only comes out if there is something really dirty, otherwise, just plain warm water again. water...turns out it is pretty amazing stuff." hope to hear more updates. i have experimented with no deodorant, "natural" deodorants from the health food store, and just using alcohol or baking soda on my pits, and the results were grim. 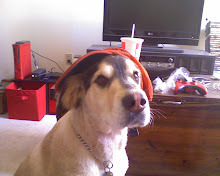 mutt didn't mind, but i didn't go out in public and raise my hands, let me tell ya. i think kylie reported good results with baking soda? kylie? thamks, numees! i love you! 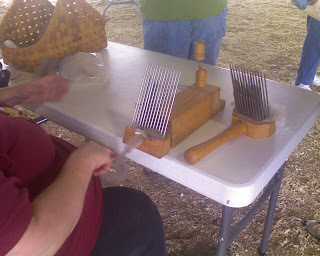 i caught the last few minutes of Laryssa's demonstration on using fiber combs. 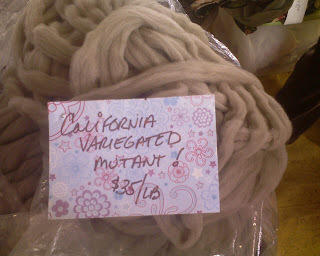 it was Laryssa who sold me the CVM (california variegated mutant) roving. 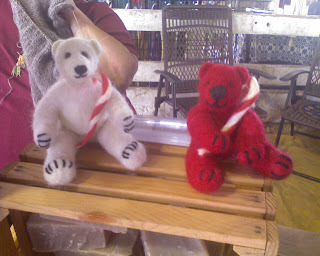 i am not sure who felted these bears, but my guess would be Laryssa? they were sweet. 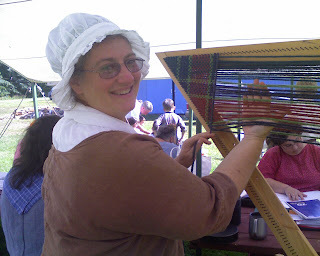 i was out of fiber, and needing to make hats, so last week i headed to the Endless Mountain Fiber Festival to see what i could find. EMFF has only been going on for a few years, but has really grown, and is getting better every year. above you see a sweater knit from dog hair. scrumptious! i hereby vow to never shave Mutt again, and go back to harvesting his fluff. 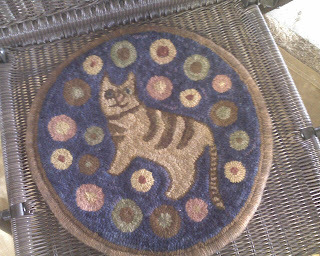 this was found in the booth of Kristina Conroy of Spunwoven Designs. 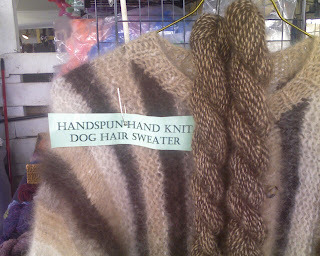 she does custom pet hair spinning and can be contacted at http://www.spunwovendesigns.com/. there were lots of critters there. 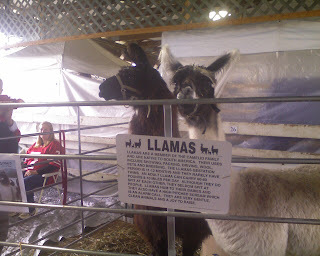 bunnies and llamas and alpacas. and sheep, of course. 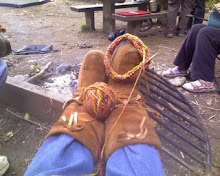 i picked up a bag of alpaca from Dunn Spun Yarn. 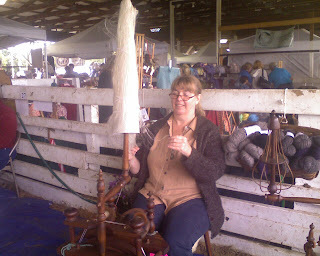 i haven't had a chance to spin it yet, but the test strand promises to be lovely :- ) Luann and Mike dunn do hand-turned knitting needles, shearing, and hand-spun yarn. talk about spinning skills. 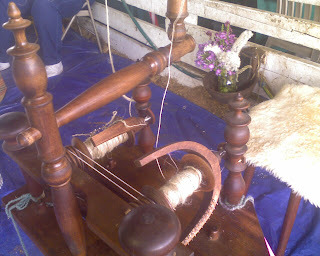 i stopped by cyndy donohue's booth, where she was spinning flax. it's hard to tell from the pic (i was using a camera phone) but she is spinning two-handed, as in two threads simultaneously. i was pretty impressed. i was loaned a scanner recently, and last night i was able to actually make it work. i'll be able to save and share photos that have been languishing in boxes, finally! for those of you who have been reading my blog for awhile, you may remember the story of my baby girl in "the princess and the pantheist". this is a picture of jaquan shortly after she came to live with us, at 5 months old. this picture is special to me for many reasons. first, it's the youngest photos that exist of her, except in hospital records. 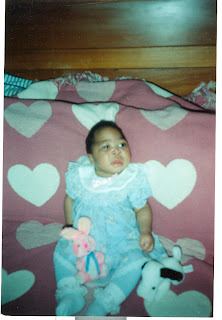 second, J. was blind, and rarely had her eyes open. and thirdly, what is really, REALLY special is what you don't see in this picture....on either side of the bed, crouched down out of sight, were my 2 young sons, ready to grab her if she toppled over or started to choke. that this sweet little girl had a huge army of supporters waiting in the wings to do whatever it took to make her life the best it could be is a miracle. what really took my breath away was the sacrifice my children made, without complaint, to make it possible for us to care for these special kids. there were countless little league games missed, plans changed, nights of sleep lost, and so many days where the focus was on the foster brothers and sisters....richard, josh and rachel were the real heroes in our household....they gave up so much for these little ones. i love all of you very much....your hearts are almost too big for this world! 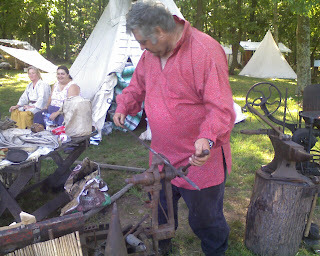 here's 2 photos of Gary doing his smithy work...he's making a stand for holding a muzzleloader in camp. "i keep saying it doesn't get any better than this, but then it does"
this is a test! Looks like i'll be able to mobile post from here just fine. 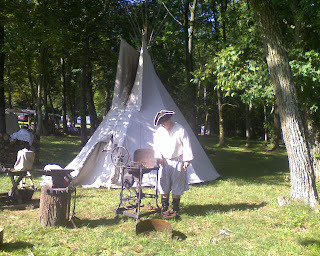 Here's a shot of Gary and Judy's tipi with Mitch hanging around the forge. 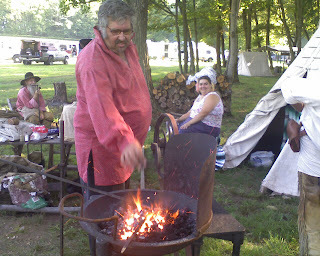 Gary's a blacksmith and i'll get photos of him later when he fires up. 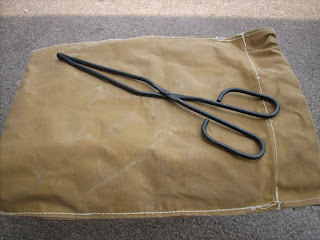 my fire tongs, out of order. i hate when that happens. they are 13 1/2 " long. 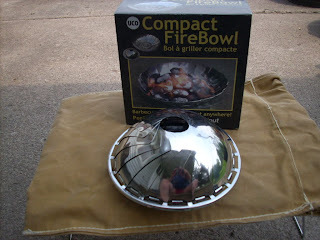 i've had the grilliput compact firebowl for awhile now. 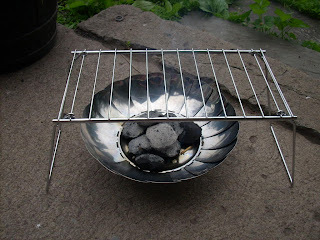 it's small and lightweight and provides a contained area for a fire or for charcoal when you are camped where there are no firepits, or you just want a tiny fire for cooking. it weighs 9 3/4 oz. and sits 1 inch off the ground on 4 metal legs. it is very stable. 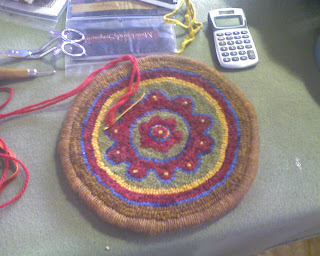 it measures 7" in diameter closed and 11" opened. i found it was too high off the coals for my liking, and i also wanted legs that were pointed, that could be poked into the ground. 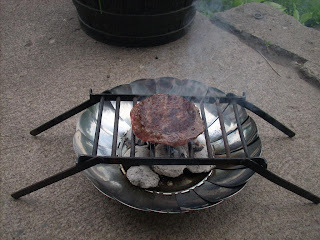 this is the small folding grill i use at rendezvous, and found this worked much better, plus i already owned it. 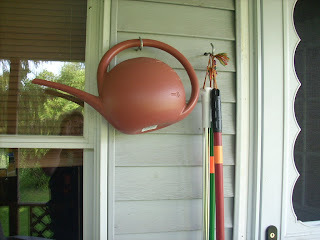 dual purpose! 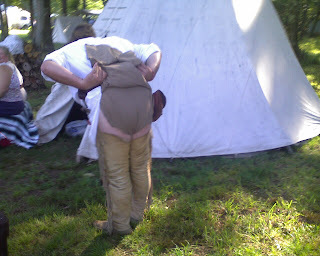 on softer ground, the legs can be poked into the earth to stabilize i, or raise it up a little higher. i have a canvas bag that the 2 items slide into to keep my other gear clean. 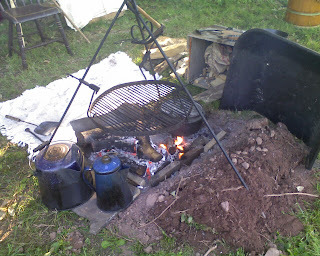 i will take pics of it in use this weekend, with my squirrel cooker! Who blogs about tunafish, anyway? 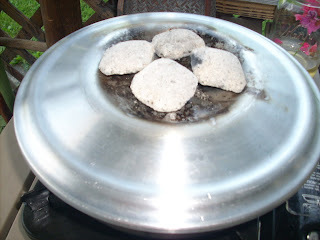 we have had a running discussion at vandwellers about foods that can be eaten without cooking. gary gearloose and i have essentially bonded over this topic. after paddling and puns, of course. 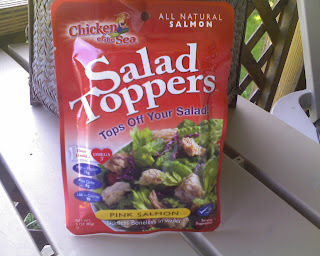 so anyhow, one of the things we vandwellers like are the foil pouch premium wild caught alaskan salmon. 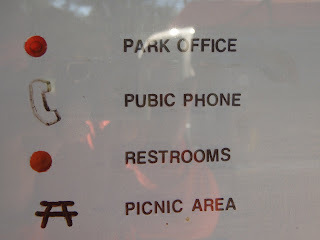 which, interestingly enough, is a product of thailand. go figure. we are always comparing pouches as to weight and cost and availability. i usually buy my salmon at wakmart, where a 2.6 oz. pack is .98 cents. gary's source recently dried up, which was a 3 oz. sized package for a dollar. above is the walmart salmon. it has 2 gms of fat, 360 mgs. of sodium, and 0 carbs. i love it with rice or right out of the pack. yesterday i found this at the Dollar Tree store in town. i almost passed it by, because i thought "croutons" for some reason. 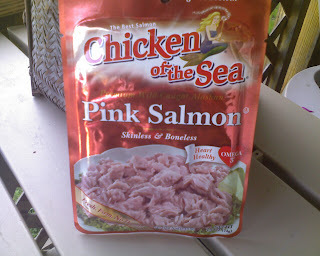 when i went back to look again, i read the ingredients "alaskan pink salmon, water, vegetable broth (with soy) and salt. "ewwww" i said. "i only like real salmon without that other stuff in it". fortunately, when i went to the rondyvan, i took the time to look at the ingredients of my "pure" salmon, only to find the exact same ingredients! so i went back for more. with a shelf life of 01-11-11, i don't need to worry about shelf life. and the best part? it's a whole 3 oz. 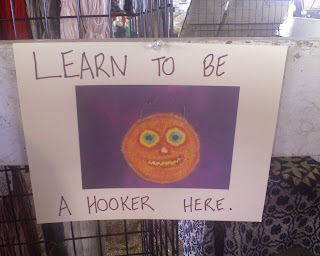 and only a buck! yay! so, what, you ask, is the tunafish in the title all about? the Dollar Tree also had some foil packs of chicken of the sea tuna for a buck. there is 3 oz. in that pack also. 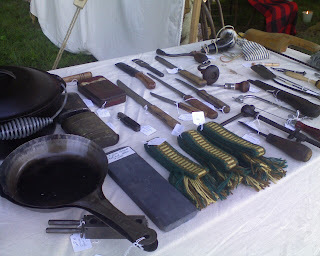 again, a product of thailand. the tuna has less fat (1 gm) and more protein (20 mgs. as opposed to the 15 mgs. in salmon). salmon is good fat, though, right? i had a picture of the salmon but it went away through no fault of my own. really. and shredded mozarella with "jamaica me crazy", a pepper blend i got at Granzella's this spring, liberally sprinkled on top. 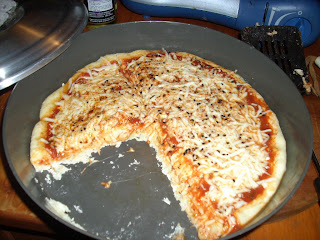 which was a really good tasting pizza that was just slightly undercooked, meaning that the cheese wasn't as bubbly as i would have liked, and the crust, though done, was not browned much. i think there may be a couple reasons for this.....one, i only had the 4 briquets on top. if you remember my post a few days ago about the cinnamon rolls, i had a real twig bonfire going on that one. 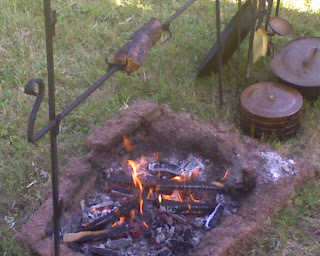 i think with more briquets or additional twigs, i would have gotten a better temp for baking. 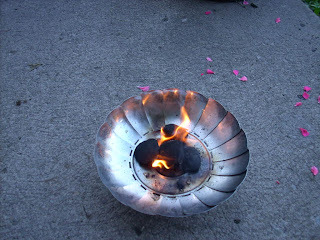 and second, there was a breeze tonight, and the flame did alot of sputtering. i imagine that would effect the temperature. i think i will turn the flame up higher next time. 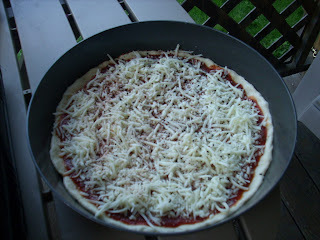 still the pizza was really good, and certainly a nice break from the usual for dinner. i'm gonna try again next week, and see if i get better results. i'll keep ya posted! i hadn't been planning on spending the summer here, but i am glad i did. 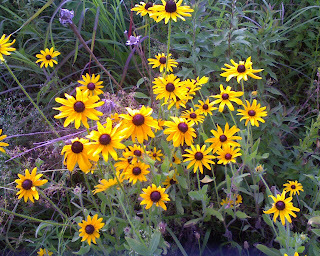 the weather has been mild and wonderful, only getting warm and muggy a little this last week or so. 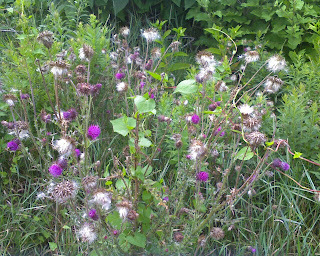 i have been getting alot done and experienced alot of spiritual growth, for which i am deeply grateful. 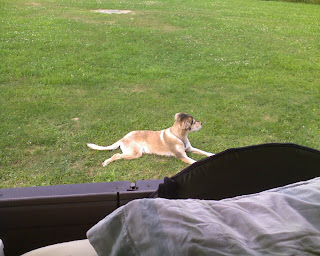 i keep saying that it doesn't get much better than this, but then it does :-) looking out the rear window of the rondyvan at mutt surveying his 100 acre kingdom. 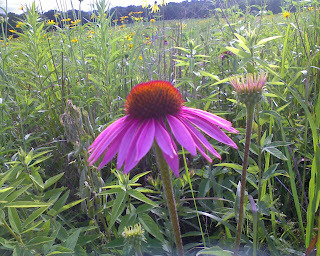 my brothers have been working hard at returning the farm to it's native habitat, planting wild grasses and reintroducing wildlife to the area. i grumbled alot about that at first, as i am not one to handle change well. i should say that as past tense, because part of my spiritual growth has been finding serenity even when change frightens me. when they did select timbering along the swamp, i was upset at the loss of trees. 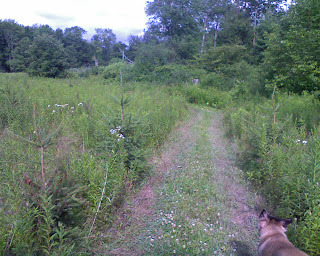 but the understory took off, and the berry bushes flourished, providing food for us and the wildlife. so i will be a little slower to judge, now, without hearing and seeing first. a good lesson. 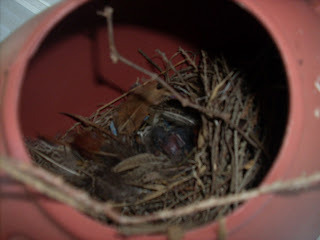 the babies have since moved on, and there is peace on the porch once again. 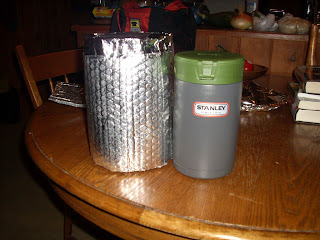 i recently picked up a double-walled stainless steel thermos to try out for thermos cooking. initial attempts with brown rice and steel cut oats and wheatberries brought mixed results, which i will chronicle in a later post. 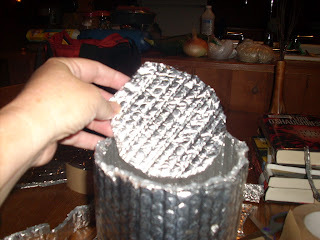 one thing i decided was to try to make a cozy that would increase heat retention and inprove cooking. so i have this friend. really. and when he's not out slummin', sometimes he talks to me on the phone and we solve the worlds problems. 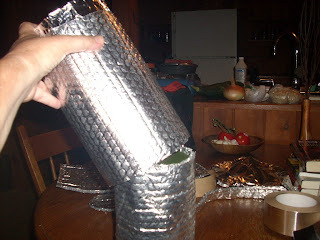 or even my thermos cooking ones. 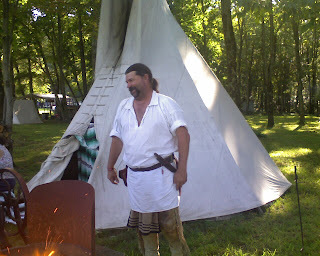 so the other night ron starts, in the way he is so talented for doing, to throw out all these ideas on how to improve on the cozy i am dreaming up, and then to top it off, he leads me to believe that i am even thinking them up on my own! how sweet is that? 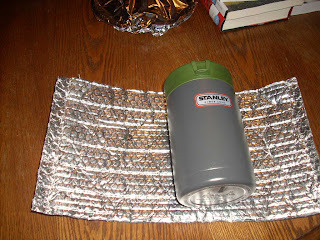 so anyhow, my Stanley Thermos Food Jar is 7" high, and 4" in diameter. 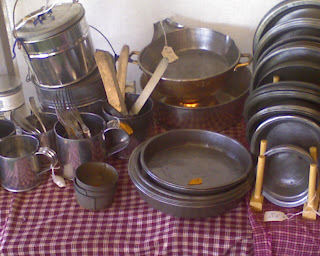 i am telling you this because i don't have the can of coconut milk handy that is my universal item for size reference. eh. 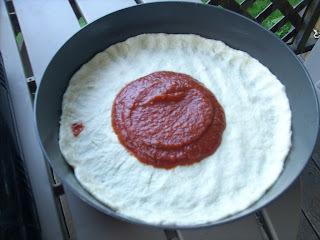 the jar holds 20 oz., which is a perfect size to cook a meal for me, and not have to worry about refrigerating leftovers. 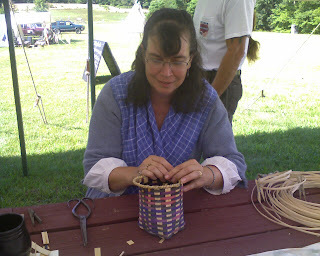 this jar is also unique in that it's mouth is wider than any others i've seen, making clean-up easier. i started out by cutting a sheet of reflectix 16" by 8 1/2 ". this was easy using a 16" wide roll of reflectix that tara left here last year. 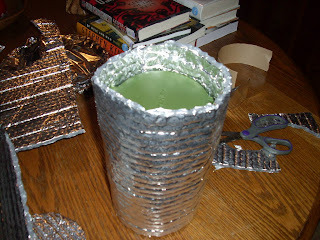 i taped it around the jar securely, but not too snugly, using that silver foil tape backed with paper that laren told me was perfect for joining reflectix together. 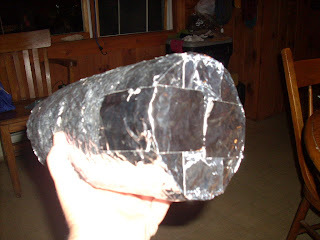 it did this very well, and quite sturdily, considering it is the flimsiest feeling stuff...like sticky tinfoil. 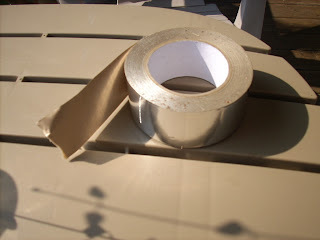 and taped them in place. 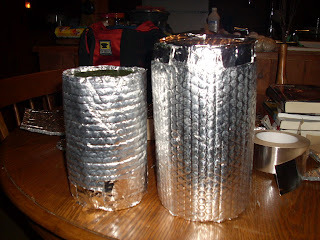 i made a second cylinder of reflectix just slightly larger than the first, and put a double thickness base on it. the larger cylinder slides over the top of the smaller cylinder, efeectively and quickly giving you a double walled cozy surrounding the whole jar. 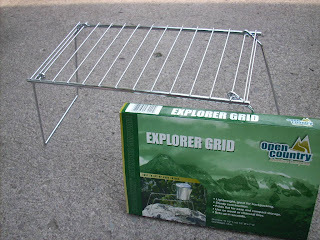 it is light and compact and will work for keeping heat in, for cooking.....or out, for an iced drink.